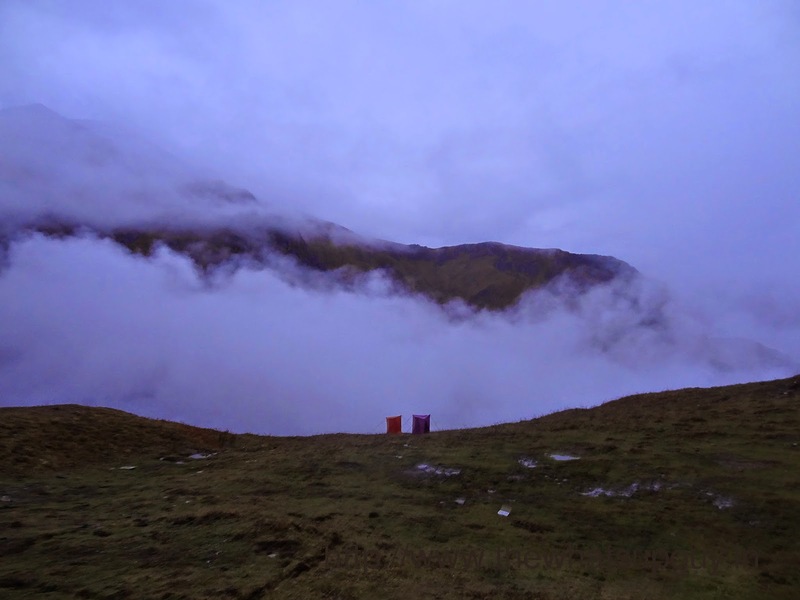 You are sleeping in your warm and cozy tent dreaming of reaching Roopkund and talking to the skeletons, and then you are pulled out of your sweet dream world. You need to pee. You know this was coming. You drank so much water in the day. But you had no choice. Now you have to go out. In the Cold. Leave your warm sleeping bag. Leave your cozy tent. Go out in the cold. Oh the terror. Once you have gathered enough will power to do it, you struggle to find the torch in the pitch darkness that surrounds you. Then once you have got it you wear a couple of extra warm cloths in the cramped up tent. Now you reach out and with great difficulty unzip the front of the tent only to realize that it was the mosquito net that you unzipped. Then you curse yourself under your teeth and unzip the correct zip. The first wave of cold air hits your face and you start to reconsider your decision. But when Nature Calls you need to go. So you gather the last bit of your courage and keep your feet out and try to wear your shoes. The amazing mountaineering shoes with great ankle support are not so great when you have to wear them sitting inside a tent with your legs outside, bending way beyond what you are comfortable with. Finally you decide its not worth tying the lace. But now you have to open the outer zip of the tent and with that you will be exposed, vulnerable, unprotected to the harsh world outside. The world already seems like a better place. You now have only one aim. Go back to your sweet spot in the tent. The rest 1 minute goes in a flash as you quickly walk back, get into the tent, zip the tent up, get into your sleeping bag and go back to your dream world in the Himalayas. PS: All events in this post are fictional. Any resemblance to real events is purely coincidental. PS2: This was written with a guys point of view. Things would differ at a crucial juncture for obvious reasons for the other gender.